I had every intention of abandoning this blog as silly and useless. A wasteful dredge on my time, but I’m feeling isolated and sentimental about my move to San Francisco in two weeks so I thought, rather, I’d take this opportunity to shift the focus of this blog in a whole new direction just in time for my move. So, alas, I am back. Let me start with the new focus of my blog. I’d like to get a more set schedule going here with a bit more structure and a lot less chatting about my day. My day was boring, don’t worry. Writing is probably one of the least exciting physical activities of all time. A lot of type, type, bang head against hard objects sort of thing. Anyway, the travels have subsided, blah blah that’s my personal life, who cares? So what I’m thinking is this. When I’d originally planned this blog I wanted it to be a very collaborative platform for young writers to express… well, whatever they felt about writing. But I don’t know any young writers so it became more of a personal journey that went fairly awry. Anyway, I still like that idea. Young writers, if there is anything you wish to share, even just word-vomit about how your mother doesn’t understand you, please feel free to message me or post in the comments. I’d love to make this a collaborative venture, if anyone is interested. Mondays: A personal look at my own writing progress. Where Elysium stands or any of the multitude of projects I’ve been working on (or are soon to begin as my MFAW program nears a start). Wednesdays: Actual content. This can be anything from a piece of fiction I’ve written to an interview, heck, maybe even some entertining literary analysis (yes, that’s a thing). Basically, anything pertaining to writing I can generate. Sporadic: Rants and raves and (since I’m an egoist) lots of tales of personal woes, I’m sure. I’m a very whiny passionate person. But I swear to god, if you even think the word “editing” I will punch you. 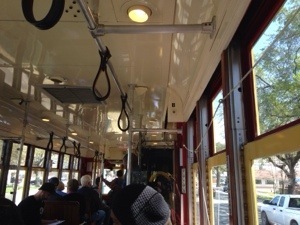 I’m really getting mobile with my upload today and sending a blog live from a streetcar heading into the French Quarter. My short article on saying goodbye to New Orleans went up today and the response has been overwhelming and supportive! It’s been lovely to see all the likes and shares I’ve gotten for something that was genuinely fun to write. I know we are the generation that has been overwhelmed by positive reinforcement, but there is nothing like a good response from your peers to make you feel good as a writer. I am not in denial about this quest for positivity. Same with blogging… Who looks at their notifications and thinks “Damn, another follower!” Keep the responses coming! It’s what keeps me coming back for more. So I’m more than excited about the response to my writing. No complaints. Just keep writing, right? Let’s hope there will be many more articles to share with you guys in the future! Well… Finished Chapter 15 on Friday and was more than thrilled to start Chapter 16 because it’s a pretty important one (not that they aren’t all important, but it is one of my favorite character’s first time to really hit the spotlight and I’m excited to write him). Then the weekend happened. I love what I do all week, but even then, weekends are great, but this one was particularly good because an old college friend was in town and New Orleans has a lot of fun around St. Paddys. So I didn’t work then. Then yesterday… I made the mistake of posting a tid-bit about grad school on my facebook which meant that my facebook and phone started blowing up all day. So I wrote about 500 words, most of which (I realized late last night) need to be cut. On top of that, I just got to a coffee shop that I continue to come to even though (Every time!) I perpetually drink too much coffee and make myself sick. And I just put three sugars in said strong coffee so… I am a ticking time bomb. I may detonate like rocket fuel any minute now. I read a lot of productivity articles while procrastinating. It’s actually one of my favorite procrastination efforts because it creates the illusion of productivity. They all offer tips about efforts from meditation to isolation. Some of them are silly. Most are repititious. Hardly any of those tips work for me (If I start cleaning my desk, the house will eventually be spotless but I won’t have a word written). I hear this one a lot, because it’s the easiest fix. If you can’t write in your room because there is a bed and you have a terminal affinity for napping… then leave. Try writing outside (weather permitting). Try writing somewhere public and loud. Somewhere quiet. Somewhere with all your favorite things (even if it’s a weird place to write… like a bar). Everyone responds differently to different places. Just because your quiet room was the spot to write yesterday, doesn’t mean it is today. Inversely… if you have a spot where you’ve hit a roll, stay there as long as you can! That space is now tied mentally to a productive work day. Try going to the last place you killed it at! Whenever I can’t work, it’s because I’m stuck in my own words. Give someone else’s words a try. 3) Get a writing buddy. I personally can’t write with another person around. My brain is hardwired for conversation because it’s easier than writing. I like to get a buddy that I can check in with and be like “6,000 words today! I am the Godzilla of children’s literature!” Have someone waiting on your writing… they’ll bug you into submission. Sounds weird, but get yourself a little exercise-high. You’d be surprised how feeling good can get you going. 5) Don’t let that cursor blink. Make a game out of it. Just write random words… Just list a bunch of adjectives that describe one character. Describe your best friend. The room you’re in. Your favorite memory. Just write and eventually you’ll get back to your project. I once had a teacher that gave us one minute to write down every verb (although this would work with almost every part of speech except articles/conjunctions) that popped into our mind. We could even just repeat them until a new word popped in. Then we wrote stories by connecting those adjectives to each other. 7) Read your own work. I hesitate to say this because it’s normally how I get stuck in an editing loop, but sometimes it’s refreshing to just go read your favorite passage in your work to remind yourself why you’re writing it. I get stuck thinking about other projects a lot. I spend all of my bad days sitting here thinking about this blog. So I’ve decided to do the blog first thing… Get it done, and put it aside so you can move on. This doesn’t apply to never-ending wastes of time. Do something with a clear end-point. That means no facebook… no youtube clips… you’ll be looping forever! 9) Sit in complete silence. No technology. No writing even. No people around. Just sit there. Listen to the subtle sounds you never notice. Sit there for as long as you can until your brain can’t handle it and starts jumping around in your head. Write down the first thought that makes your brain go berzerk. 10) Take that nap, afterall. Too tired to work? That’s ok! Naps can be a like the fresh-start of a new day. Maybe you just need to start over for a while. BONUS) Still nowhere? Give it a break. Don’t sit there and torture yourself. Today wasn’t your day. Go to bed early. Knock a few things off your to-do list. Get back in there tomorrow… Just don’t let tomorrow become the next day! Feel free to share any Productivity Tips you guys might have. I’m always looking for some new trick to jump-start my brain. 1) Sleep just a little bit longer. 3) Set up a new Word document. 5) Do I need to go to do any errands? Post office maybe? Walgreens? No? Damn. Why did I even put on pants then? 8) What about the grocery store? 10) Current events. That’s important. Cool… String theory! 11) Any new HBO shows I should watch? What do you mean I’m all caught up on Girls? 12) Hello Facebook, anything exciting today? 14) Write three sentences… Good work. God, I want cake now. 16) That was the best cake ever. I should go to the gym. 17) Get dressed for the gym. 18) Sit down to put on gym shoes. 20) Sit down in front of laptop. Watch cursor blink. 21) Maybe I need music? 22) This is a great song. Let me research this band at length. 23) Wow, I’m learning so much about science! 24) I should water my plants. 25) And read this book. 27) How about writing a blog now? 28) Text friends about blog post. 29) Obsessively check blog for notifications. 30) I’m too cold to write. 32) God, Le Novio’s couch is comfortable. Pretend to nap but actually play Candy Crush and text friends. Why Am I Not Asleep Yet? This is insane. I just want to go to sleep. Even better question: Why did I think posting a blog would be a solution to this problem? I think I have a blogging addiction.